I’m currently monitoring most of the processes that I need info about with collectd, but it seems that the default mysql plugin does not support metrics related to innodb. I’m aware that is a python plugin that could add support for this, but I’ve decided to give telegraf a try. Telegraf is a metrics gathering tool written in Go, hence distributed as a single executable. It was designed to be easily extendable, and has a minimal memory footprint. Because I’m on debian, I’ve opted to add the apt reporsitory from InfluxData to my system, so that updating in the future is a breeze. You can optionally also configure additional security through the use of username/password or via an SSL certificate. 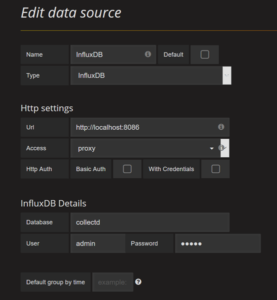 Also don’t forget to setup your influxdb machine to only accept metrics data from your known hosts via firewall settings. As you can see, I’m using the debiam sys-maintenance user. You can alternatively create a specific database user for this. After restarting telegraf, metrics started flowing in on InfluxDB. The data gathered by the mysql plugin was easy to use, and hence I ended up with, among others, this chart panel in Grafana. All in all, this was an immediate upside of telegraf for me, which triggered me to explore more of its plugins, and perhaps use some of them instead of their collectd counterparts.